In the formation of both gold bumps and copper pillars it is required to contain the “plated up” structure within a “mold” of polymer material that is most effectively created using photolithographic techniques. 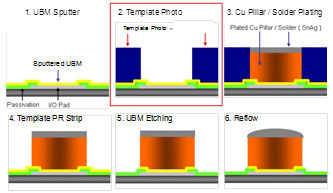 As the bumps and pillars need to be relatively high above the surface of the chip the thickness of the Photoresist needs to be relatively thick, the same as the height of the pillar. If the pillar needs to be 50 microns high then the polymer needs to be 50 microns high or perhaps a bit higher, to ensure that the pillar or bump does not “spread” at its top. The Bake of such thick films must be done in such a way to ensure that the film does not “film over” … dry out on the upper most layer before evolving solvent from lower levels of the resist, thereby creating bubbles and blisters in the resist film. The rate of heating of the substrate needs to be controlled and should not be too fast so that film defects can be avoided. As the resist film are very thick there is a lot of solvent that must evolve from the cast film in the hot plate chamber. If the hot plate chamber is not properly designed and configured the evolving solvent will condense in the hot plate chamber and reflux (drip) on the wafer(s) being processed resulting in the need to at least rework or suffer reduced yield. Such poor design can only be mitigated by frequent cleaning of the hot plate chamber. A properly designed and configured hot plate chamber/assembly requires no such cleaning. To minimize costs a uniform very thick resist film can be achieved using S-Cubed’s tools and patented technology.